Google has launched their job results in the UK! This means with just a code tweak to your website’s jobs, you can publish them straight to Google. You can also use a third-party job board to advertise a job on Google without customising your website, we will go through both options in this article. How to post a job in Google’s search results via your own website. If you have job listings on your website and know how to add structured data to them, then Google has provided a guide in their search console on how to add the essential tags and information to your jobs. Follow this guide, Get your website’s job listings on Google. If you don’t have job listings on your website and don’t know how add structured data to your website, then you can use a third party (list below). Once you have your jobs being picked up on search console and have added all the required data to your listings, simply publish the jobs on your website and Google will include them in the search results. Receive applications on your website. Since Google is a search engine and links to other websites, your job applications will be sent the job listing on your website, so you can just manage the application how you would normally. This means, you can add screening questions or a custom application form on your website and have more control. How to post a job in Google’s search results via a third party. There are several job boards that have integrated their site to post directly on Google’s search results as they see the massive potential it has to their application numbers. How to get your jobs listed on Google. 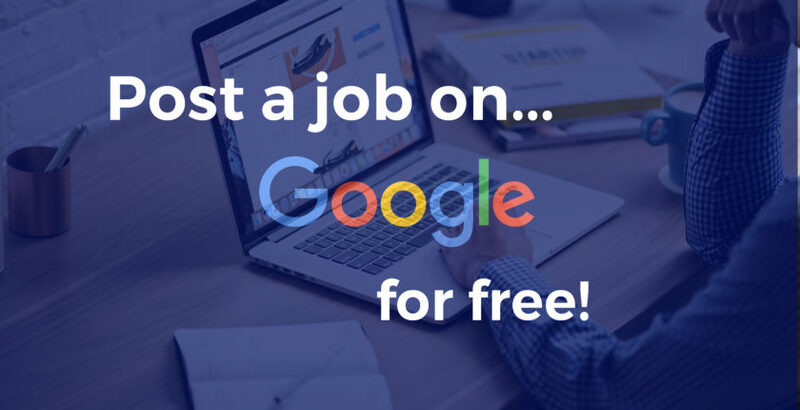 To list your jobs on Google, you can either customise your website’s job listings and integrate them to show up in Google search results for free or you can use a third-party website and when you post a job on their site, it will be automatically picked up by Google. Should I list my jobs on Google? Yes, having your jobs listed on Google is a good approach to finding candidates for your role. Since Google has released jobs in their search results, you can now find talent before they reach the job boards. Most job searches start from Google, therefore having your job listed on there makes perfect sense. Can I track my job applications from Google? Yes, you can track your job applications from Google within the search console. If you have structured your website’s job listings correctly then you will start to see traffic and analytics from your job postings. Since Google send applicants via URL to your website, you can also use your own website’s anaclitic tools. Which job boards advertise jobs on Google? Most popular job board sites will share their jobs in Google’s search results. How much does it cost to post a job on google? Our jobs go on Google! When you advertise a job with Post My Job, we will also show it in Google’s search results. We specialise in job advertising and have helped thousands on employers across the UK with posting their jobs on multiple job boards. Over 80% cheaper than going direct to the job boards. Post a vacancy today and have your job listed on Google and showcased across leading job boards from just £95. Advertise a job or see our full network.